National Spiritual Mobilization Movement propaganda postcard, c. 1940. The postcard is captioned “Always be prepared to serve our homeland / National Spiritual Mobilization Movement”, published by the Postal Insurance & Postal Pension. 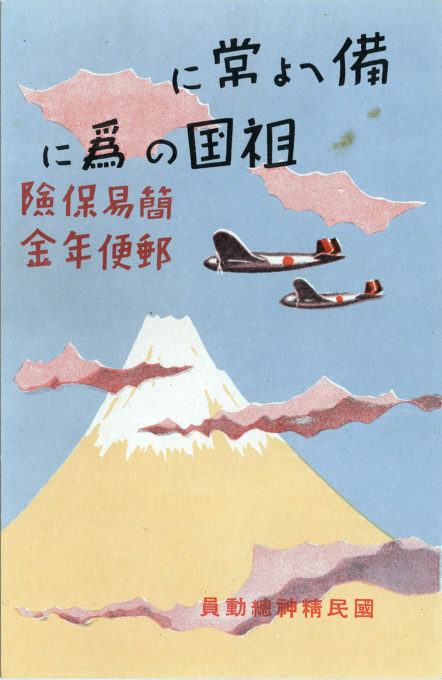 From the wiki: “The National Spiritual Mobilization Movement (Kokumin Seishin Sōdōin Undo) was an organization established in 1937 in the Empire of Japan as part of the controls on civilian organizations under the National Mobilization Law by Prime Minister Fumimaro Konoe. “Representatives from 74 nationalist organizations were assembled at the Prime Minister’s residence in October 1937, and were told that their organizations were now part of the ‘Central League of the Spiritual Mobilization Movement’, headed by Admiral Ryokitsu Arima and under the joint supervision of the Ministry of Home Affairs and Ministry of Education. The purpose of the Movement would be to rally the nation for a total war effort against China in the Second Sino-Japanese War.